Standing before the temple complex, one is awestruck. The temples of the trinity – Brahma, Vishnu and Shiva-Maheshvara – Bharata or Hindu tradition and culture, here, outside India! Here, the Prambanan temple complex, in Yogyakarta, Indonesia. As we approach the premise, the temples open up to our views in layers in their rugged splendor. Different, yes, in architecture and form, to what we are accustomed to in India. Sense of exotic, yet familiar; alien, yet very own and homely – that is the sensation that follows, enhances the wonder and awe, soon to be excited with a sense of relief. Well, such were my feelings on first sight, the moment of my falling in love with Prambanan. Recently, in the month of July 2018, I and my better half, Dr. Jana Bandyopadhyay, had been to attend an International Conference in Yogyakarta Indonesia. 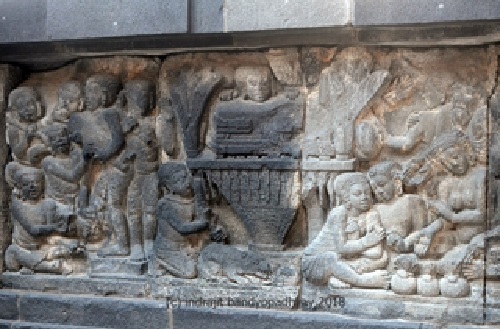 The purpose was to attend the conference and present a paper on Mahabharata as much to see the Bharata outside India through Prambanan and Borobudur, the two great world heritage sites. 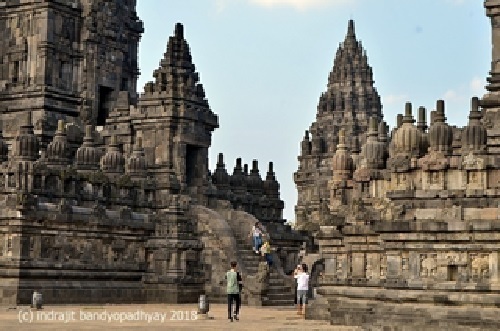 Yogyakarta is the cultural capital of Indonesia with these two world heritage monuments nearby – the Borobudur Buddhist complex (42 km) and this Prambanan temple complex. It was a long nurtured dream to visit the places. 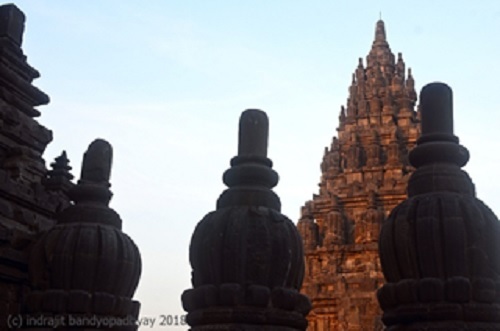 We had gathered information as much we could from the net; we had studied some research papers too on the history, architecture and iconography of Prambanan, but when we faced the temple, we found our time falling shorter than what exploration would need. On returning home, I am left with a sensation of wonder, laced with sensation of loss. Some dissatisfaction over what we had missed is good, as it provides the impetus for a second visit. We stayed at a homestay near Prambanan temple complex. There are many hotels and homestays around the complex and we had earlier checked on net and selected our stay. I prefer homestay because that gives a better chance of knowing the local people and their life-style, of a more at-home feeling than professional service in hotels or resorts, and of getting better information of the place and its setting. Mere visit to sites does not a travel make; the pulse has to be felt. From Kolkata to Adi Sudjipto airport in Yogyakarta, via Kualalampur with a layout of 2 hours, our weariness vanished the moment we set foot because Prambanan is only 7 km from the airport and with plenty of time in hand courtesy punctual flight, we decided to visit Prambanan after refreshment on that very day. Indeed that was one reason of my choice of the homestay which is only half kilometer from the temple wall. The first thing we did on landing at Adi Sudjipto was to enjoy the homely and cozy ambience with snapshots and selfies before joining the queue at immigration. We carried only hand luggage, so we could avoid the hazard of luggage collection from the belt. Stepping outside the airport, we headed straight to the ATM counters on the right of the exit gate, because we needed IDR (Indonesian Rupiah). The exchange rate at that time was about 210 IDR for 1 INR, quite an opportunity for feeling rich. We had to have this calculator ever active in the brain to understand the cost of living and price we would be paying for any expense on Indian standard. We took a taxi from the nearby taxi-stand outside the airport. Better to avoid taxis within airport area because they charge high including the parking charge. Initially we had approached one, and it charged us one lakh thirty thousand only (IDR, of course, but giving the sensation of having lakhs at easy disposal) for a journey of 7 km only to our homestay. So, we stepped outside the airport area, took the right foot, walked a little to reach taxi stand, and booked a taxi from there. This time, the charge was 65000 IDR after a bargaining slide from 80000 IDR. Well, that is around 310 INR. Anyway, paying 65000 for a taxi ride of 7 km is a memorable thing to get accustomed with, for soon we would be paying 2000 or 3000 or 5000 for a cup of good tea. After checking in our homsestay and satisfied with the welcome of our very cordial and sincere hostess, we took shower and some rest before moving on to our tryst with Prambanan. Before that, we lunched at a local restaurant on Jalan Prambanan (Jalan = Road). We had lunch with Gudeg, white rice and telurpindang (sweet egg). Godeg is a very popular local food here. I got the recipe from net: it is a sweet-flavored dish made from jackfruit stew. The raw jackfruit [known as gori] is stewed for quite some time in a claypot till it becomes soft and tender, and then served together with coconut milk, palm sugar and spices (salt, pepper, garlic etc). After lunch, we walked to Jalan Raya Solo, the main road running adjacent to the temple complex, and further walked towards the entry gate on the East. As we walked along the broad footpath along the southern temple premise wall on the Jalan Raya Sola, we soon noticed two ancient gate-pillars on either side of the road. As we neared, we noticed an emblem on the pillar. I instantly checked on net and learnt that it is the Central Java symbol. 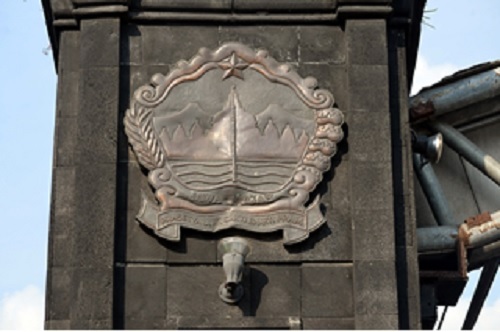 In short, the emblem symbolizes the future of the people of Central Java, towards a just and prosperous society based on the One Godhead. In 1945, the then future President Sukarno promulgated Panchasila which is an amalgamation of elements of monotheism, nationalism, and socialism, developed under the inspiration of Indonesian historical philosophical traditions, including indigenous Indonesian, Indian Hindu, Western Christian, and Arab Islamic traditions. We had already fallen in love with Indonesia, and seeing how the country, despite being a predominantly Muslim nation, has preserved its Hindu and Buddhist tradition, we felt deep respect for the country and its people. Entering through the eastern gate of the outer premise, we had to walk a bit to reach the ticket counter for foreigners. The price is 7 lakh IDR for two tickets. 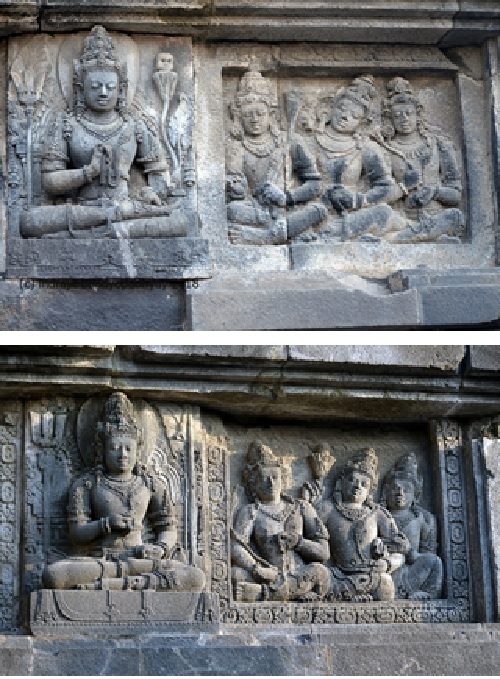 It would cost 10 lakh IDR for two days pass, or joint visit with Borobudur or Ratu Boko. So, better to purchase the two days pass to save some money for a plan of combined visit to Borobudur or Ratu Boko. 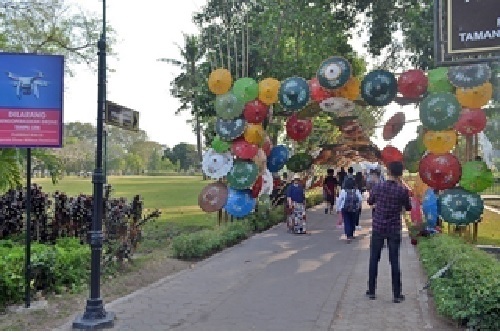 The approach to the inner premise is a pompous gate of bamboo woven net and traditional colourful umbrellas. We found display information of the complex, and stopped to check it. For a visitor it is necessary to have some prior knowledge on the complex Temple Complex lest something is missed out. So, here is a map first before we enter the inner premise. A brief knowledge of the temple history is also imperative to explore this gem. 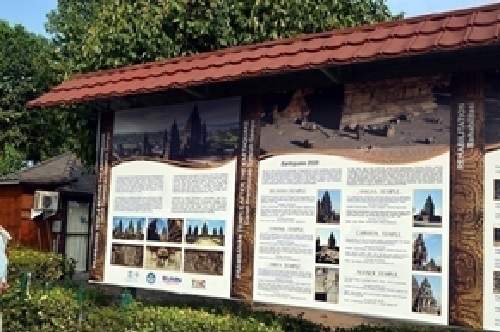 The alternative name of Candi Prambanan is Candi Rara Jonggrang, suggesting a unique blend of history and myth. 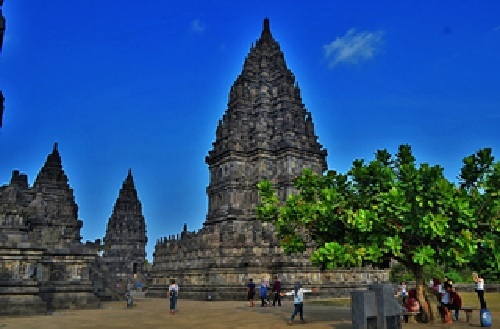 Candi is the Indonesian name for both Hindu and Buddhist temple. 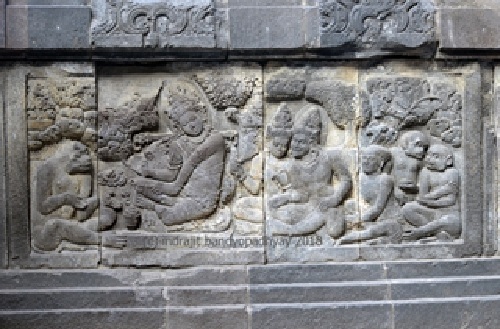 King Sanjaya founded the Mataram Hindu Kingdom and Sanjaya Dynasty in 732 AD in central Java. 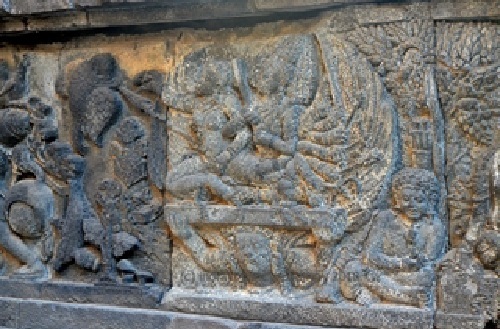 The Sanskrit inscription of Canggal dated 732 AD, the earliest inscription found in Java, and Raja Balitung inscription of 907 AD, mentions Sanjaya. King Rakai Pikatan of Sanjaya dynasty ascended the throne in 846 AD and had taken up the construction of the Shiva temple. It was completed in 856 AD. The legend goes that he abdicated after that. Raja Balitung (898-910 AD) rightly regarded the greatest Sanjaya King, further expanded the kingdom as well as the temple complex. Meanwhile the Buddhist Shailendra Empire in Java became more powerful and eclipsed the Hindu Mataram Kingdom which finally collapsed by the 10th century. 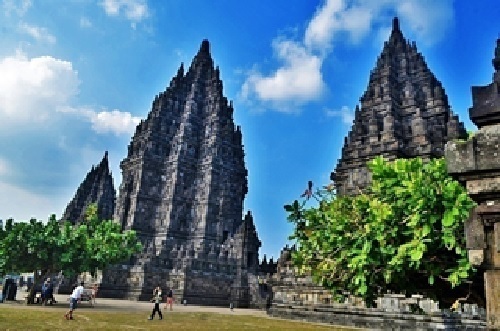 The Prambanan temples are considered as the Hindu Sanjaya Dynasty's answer to the Buddhist Sailendra Dynasty's Borobudur and Sewu temples nearby. 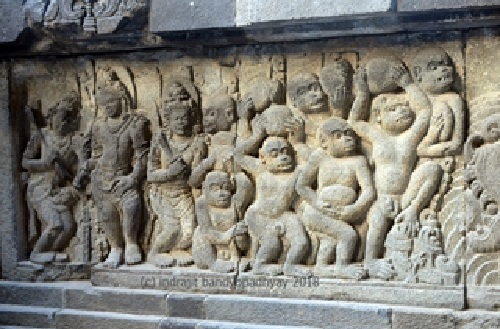 The Indonesian history once witnessed Hinduism-Buddhism conflict and synthesis, and the Candi Prambanan bears testimony to that. 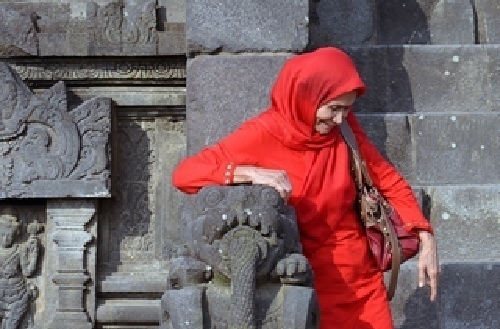 Even a layman would understand how Hindu and Buddhist architecture blends in the construction of Candi Prambanan. The Prambanan temples were somehow lost in memory and remained in ruins until its rediscovery in 1733 AD by the Dutch citizen C A Lons. Cleaning and renovation by several Dutchmen took several decades. 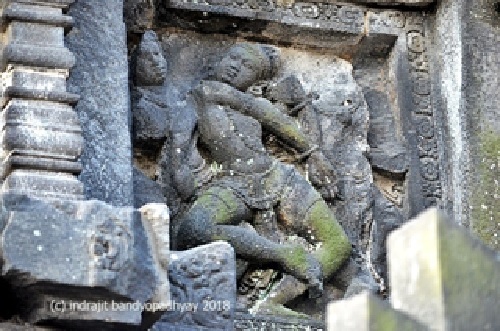 The Indonesian Government under Sukarno and Suharto supported by the UNESCO, spent millions to restore the main temples.The restoration of Siva temple was completed in 1953 AD. The restoration of the Brahma temple was completed in 1987 and that of the Vishnu temple in 1991. The Complex became a UNESCO Heritage site in 1991, and is the largest Hindu temple site in Indonesia, and second only to Angkor Wat in Cambodia. The Shiva-Grha inscription of 856 CE suggests, the temple was built to honor Lord Shiva, and its original name was Shiva-Grha (the House of Shiva) or Shiva-laya (the Realm of Shiva), and that, a public water project to change the course of a river near Shiva-grha Temple was undertaken during the construction of the temple. This river is identified as the Opak River that runs north to south on the western side of the Prambanan temple compound. 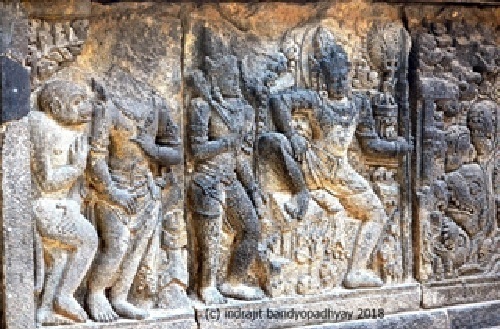 An alternative view of some archaeologists is that the statue of Shiva in the Garbhagrha (central chamber) of the main temple was modeled after King Balitung. He was deified after his death, and the inscription is to depict his deification. Successive Mataram kings, such as Daksa and Tulodong expanded the temple compound with the addition of hundreds of perwara temples around the chief temple. Most of the state's religious ceremonies and sacrifices were conducted in this royal temple. 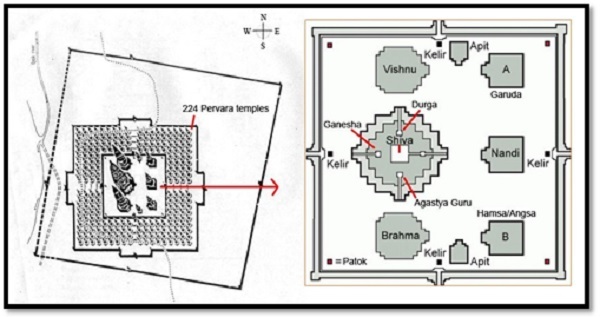 In the middle zone, there are 224 Pervara temples which are arranged in 4 concentric square rows, numbering 44, 52, 60, and 68 from inner row to outer row. Most of them are now just scattered stones. But these stones bearing memory of a glorious history add to the ambience. All the 8 main temples and 8 small shrines and 2 out of the original 224 pervara temples have been reconstructed. After entering the inner zone, we started with the central Shiva temple. The Siva temple, tallest in the complex, is seen in the middle at a distance. Its height is 47 metres and the large base is 34m by 34 m. First a Parikrama of the outer wall, trying to understand the reliefs and taking shots. 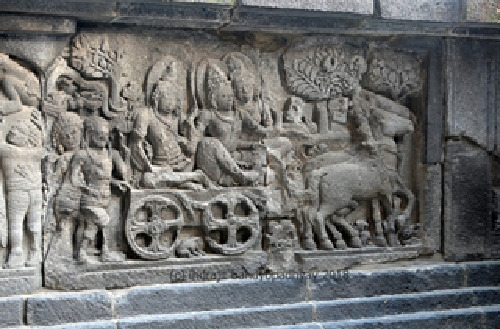 There are sculptures of Digpalakas facing the eight directions: East: Indra images; South-east: Agni images with seven tongues of fire; South: Yama images holding a 'Danda'; South-west: Surya images; West: Varuna images; North-west: Vayu images; North: Kuvera images; North-east: Ishana images. After taking shots, we ascended steps through East gate and reached the platform that encircled the temple with galleries adorned with bas-reliefs depicting Ramayana on the inner walls of the balustrades. The East-side entry and clock-wise circumambulation helps to follow the Ramayana narrative that continues in the Brahma temple. The main Garbhagrha hosts the Shiva icon, and it is disconnected with the other Garbhagrhas or chambers hosting Durga Mahishasuramardini (North), Ganesha (West) and Rshi Agastya (South). The ascending steps to these sub-temples come intermittently as one circumbulates. So, one should not miss them. The Shiva statue is 3 m; however, the Garbhagrha is very dark and only a faint light from the door enables to see. Shiva has skull and sickle (crescent) at the crown, and third eye on the forehead and his four hands hold prayer beads, feather duster, and Trishula (trident). 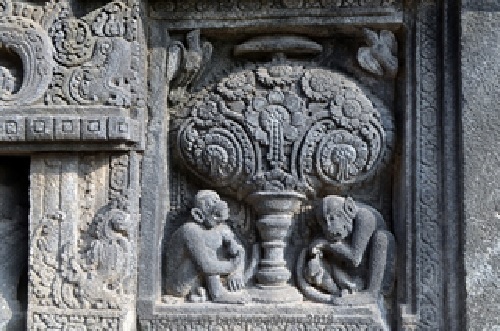 Shiva stands on lotus pad on Yoni pedestal and the north side of pedestal bears the carving of Naga (snakes). It is from the shrine of Durga that the temple gets its name Rara Jonggrang (Javanese: slender virgin). Just as there is one opinion that Shiva here is deified depiction of King, similarly, one legend goes that the Durga statue is actually the freezed form of princess Rara Jonggrang. A brief of the interesting myth. There were two ancient and neighbouring kingdoms in Java, Pengging and Boko. King Prabu Damar Moyo ruled Pengging. He had a son named Bandung Bondowoso. By contrast, a cruel man-eating giant named Prabu Boko ruled Boko with support of another giant Patih Gupolo. Despite his unpleasant nature, Prabu Boko had a beautiful daughter named Roro Jonggrang. The title Roro is an ancient honorific title to address unmarried princesses and female nobility, thus the name Rara Jonggrang in Javanese means 'slender maiden'. Once Prabu Boko, desiring to expand his kingdom, launched a surprise attack on Pengging, and the ensuring war caused devastation and famine on both sides. 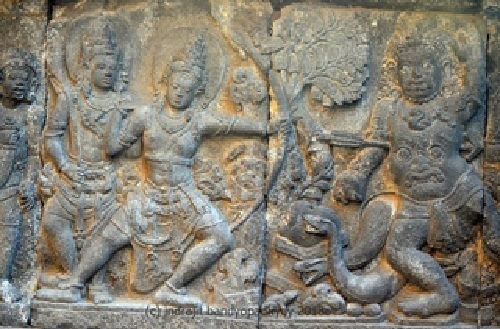 In order to defeat the invader, Prabu Damar Moyo sent his son Bandung Bondowoso to fight Prabu Boko. 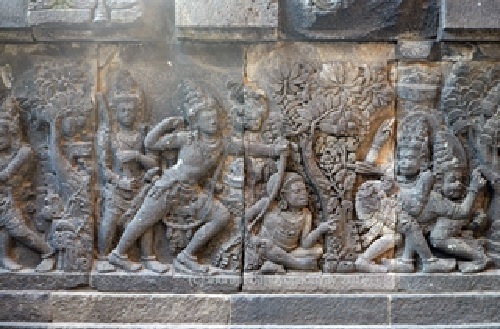 After a furious battle, Prabu Boko was killed by the prince's supernatural powers. His assistant, the giant Patih Gupolo, led his armies away from the battlefield in defeat. Returning to Boko Palace, Patih Gupolo told Princess Rara Jonggrang of the death of her father. The princess was heartbroken, but before she could recover from her grief the Pengging army besieged and captured the palace. Prince Bandung Bondowoso was mesmerized by the beauty of the mourning princess and proposed marriage, but his offer was swiftly rejected. Bandung Bondowoso insisted on the union, and finally Rara Jonggrang agreed on two impossible conditions: first the prince must build a well named Jalatunda, and second, he must construct a thousand temples in only one night. The love-struck prince agreed, and immediately started work on the well. Using his supernatural powers once again, the prince swiftly finished construction and proudly displayed his work for the princess. As a trick, she urged him to enter the well and when he did so, Patih Gupolo piled stones into it and buried him alive. With great effort Bandung Bondowoso escaped, but his love for the princess was so strong that he forgave her the attempt on his life. That stone statue is now Durga. I liked the myth but could not find any relevance, because the idol is no doubt of Durga. We next visited the Brahma temple where the Ramayana depiction, particularly Uttarakhanda continues. After that we went to the Vishnu temple that depicts Krshna-Lila and Balarama-Lila, mostly their childhood feats like killing Kaliya snake, and other Asuras. 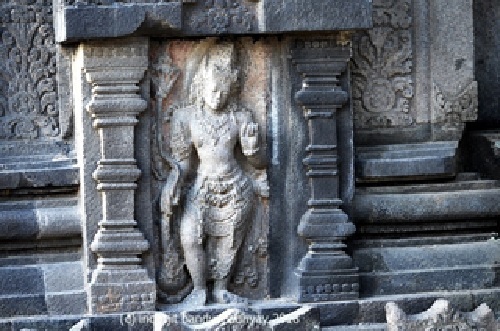 From artistic point of view, the depictions in Brahma and Vishnu temples lack the finesse, subtlety and beauty of the Shiva temple, and are sometimes even crude. As the sun wanted to set, a red hue bathed the old temples, and offered us the most spectacular and aesthetic sight. It was symbolic too – of the setting of the Mataram kingdom and the birth of history. No VISA is necessary for Indian citizens. The immigration would just stamp the passport and allow entry. Return ticket is must. 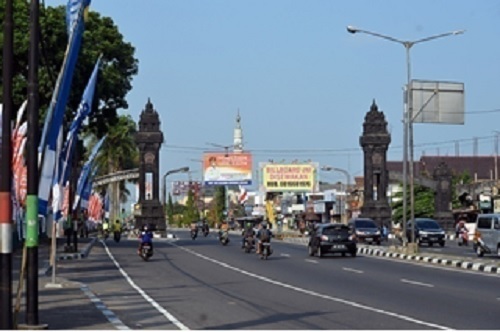 History and temple lovers should stay near the temple rather than in Yogyakarta city which is 17 km from the temple. If one likes to stay in the heart of the city, then I would suggest Malioboro Street. We stayed there for 2 days for the conference and visiting Borobudur. Definitely the most lively and happening place in Yogyakarta. Homestays and hotels are aplenty near and around the Prambanan complex. They can be booked online with the option of paying at spot. Internet has made things easier to find place of anchoring. Spot pay is the best option because any change in plan would not affect the pocket. For Indians, the current INR – IDR exchange rate should be kept in mind. That would provide perspective while negotiating price or marketing or any other expenses. Taxi seldom runs in metre; so, bargaining pays. At the city, one can experience rickshaw travel. Unlike in India, here rickshaws are pushed, not pulled. Local people are cordial and helpful. During the entire duration of stay, I did not notice a single case of conflict or altercation on the street. A smiling face wins it all. Universal. ATM booths, food joints and markets are aplenty near and around the temple. Prambanan Tickets can be purchased with Master or VISA cards. If Borobudur and Ratu Boko are in itinerary, then combined ticket will save money. 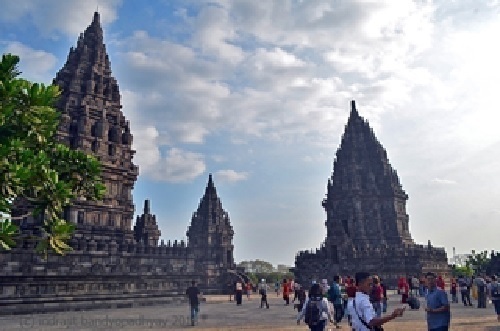 The other temples outside the Prambanan compound and Ratu Boko can be visited by hired taxi. Again, negotiation will pay. 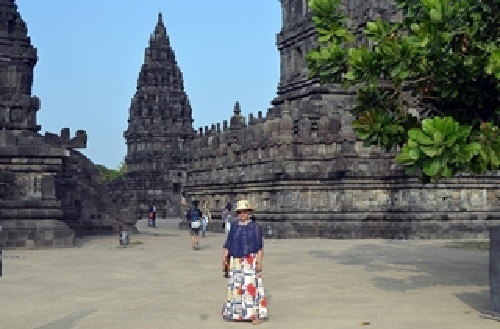 A whole day is necessary for exploring Prambanan complex and different temples within the compound. If sunrise to sunset is strenuous, then at least one should not be missed.